I just received my American Library Association (ALA) membership card in the mail. It’s hard to believe that I’ve been a member for 17 years. As the Midwinter Meeting approaches, it is a good time to reflect on membership and the Association. In all the years of membership, I have attended almost all the Annual Conference and Midwinter Meeting events and it has kept me engaged and involved in my profession. I have been able to contribute to our Association and profession and, in return, I have a solid network of librarians to call upon and an organization that supports and advocates for the work that we do. It took about 7-10 years of participation before I found a groove in the business of the Association. That may seem like a long time, but it took that long to find my calling and direction with my own professional goals. I started as a high school (technology) librarian and therefore was involved with AASL, initially serving on several committees, and LITA. 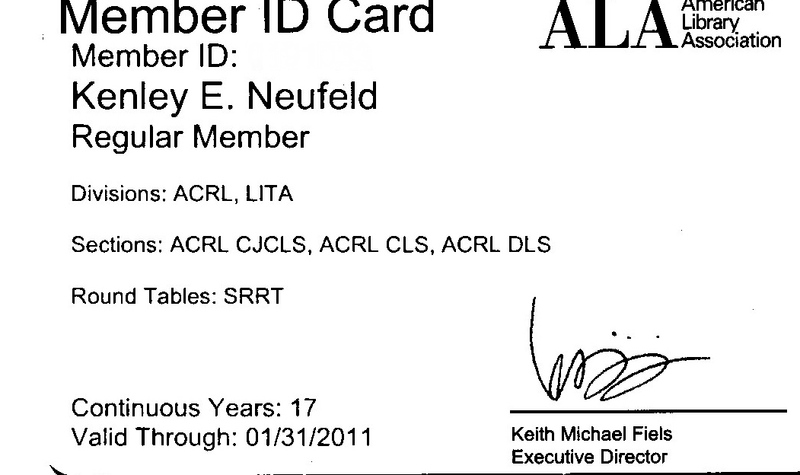 In 2001, I switched to community colleges to joined ACRL and the Community and Junior College Libraries Section (CJCLS). It was a good landing and in the last nine years have served on many organizational committees and taken on several leadership roles, primarily within ACRL but also in ALA level committees. The business of the Association can seem mundane to some and the fiscal cost of participation can by high (roughly $1250 bi-annually), especially if librarians pay their own way as I have for most of my career. Since becoming active in the business aspect, the opportunities to participate in programmatic activities have become limited. It is not unusual for me to have meetings nonstop from Friday afternoon through Monday evening. This is the cost of active participation and I don’t regret the time. I usually spend about 2-3 hours in the exhibit hall each conference or meeting, but that need has diminished as well. I’m heading to Boston on Thursday morning. The Midwinter 2010 schedule feels a bit lighter for this meeting, mainly because I am no longer Chair of CJCLS. It is also an opportunity to network further and let people know I’m a Candidate for the ACRL Board of Directors. If you are new to ALA and the Midwinter Meeting, step in and visit any committee or section meeting that you might have an interest; most meetings are open. I also recommend getting to the meeting a little early and introducing yourself to the meeting chair. When I was chair of committees, I always appreciated knowing who was present and what their interest was with the group. Further, don’t feel bad if you need to leave early or if doesn’t turn out the way you thought. This is important for new participants to feel comfortable exploring and learning more about the work of the Association. One method the Association uses for finding committee members is through the recommendations of committee chairs. As mentioned earlier, I have benefited from my active participation in ALA. If you are interested in the Association, I recommend finding a niche to demonstrate your interest. Even though virtual participation is growing, which is good, presence and in-person networking can go a long way to getting involved with the Association. Further, my involvement has greatly benefited my own professional goals and the needs of my employers. If you are a committee member, follow through is critical. It’s not all roses, and it can seem overwhelmingly bureaucratic at times, but what can you expect from an association with over 66,000 members? Be patient. Be happy. Be involved. Check out my calendar, and I hope to see you in Boston.